The Russian Super-League is one of the strongest competitions in European women’s handball. But despite their tough and top class opponents, Dinamo Volgograd reached the hat-trick in May. After becoming Russian champions in 2009 and 2010, Dinamo won the title again last season again by beating Rostov in the final series 2:0 and after eliminating former EHF Women’s Champions League winner Zvezda Zvenigorod in the semi-finals. So Volgograd are directly qualified for the Group Stage of the EHF Champions League for the third straight time – and again the Russian champions have the objective to proceed further on from the Main Round. Despite tough opponents in the last two seasons Dinamo reached the second stage twice. In 2010/11 they even threw the defending champions Viborg HK out of the competition in the Group Stage, but then Larvik and Györ were too strong opponents in the Main Round. The biggest keys to international success are their home matches. Away Dinamo only won one of six matches in the last two seasons. But coach Viktor Ryabikh can count on a well-rehearsed and improved team – almost the same as last season. The only newcomer is tall Ukrainian shooter Anastasiia Pidpalova, arriving from 2010 Champions League finalist Oltchim Vâlcea. Pidpalova, team captain of the Ukrainian national team, who won three Romanian and six Ukrainian national league titles before – is now ought to support Anna Kochetova from the back court position. 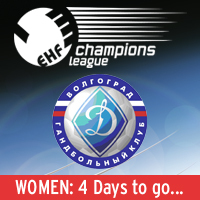 With 63 goals Russian international Kochetova was Dinamo’s top scorer in the EHF Champions League season 2010/11. After a long injury break she finished on rank 13. Volgograd is well-known for their fast match play, especially by their young but experienced wing players. The top guns of the team – aside Kochetova and Pidpalova – are back court shooters Tatiana Khmyrova and Olga Levina, pivot Ksenia Makeeva and goalkeeper Anna Sedoykina – all members of the successful Russian national team, current World Champions. Except for four Ukrainian players the whole team consists of (mostly young) Russians. Dinamo’s biggest success was reaching the semi-finals of the Women’s EHF Champions League in 2000. But by winning the EHF Cup in 2008 they re-started their history that now brought Volgograd to their in total twelfth participation in the EHF Champions League. But the start into the new season will be tough – not only because their strong Group Phase opponents from Vâlcea, Itxako and Buxtehude, but also because of the long-term injuries of Khmyrova, Milova and Dantshina. Find more information on Dinamo Volgograd HERE.